Asian markets ended mixed as lingering uncertainty over the timing of a bailout for Spain, downbeat PMI’s services data from China and a widest trade deficit in 3.5 years from Australia turned investors into cautious mode. After surging 38.6 points in the last 6 sessions, Bursa Malaysia ended 1.3 points lower on profit taking. In a volatile trade, KLCI fluctuated within a low of 1640 (-10.6 points) before mitigating its losses at 1649.8, dragged down by plantation heavyweights i.e. SIME (-33 sen to RM9.41), KLK (-114 sen to RM20.90), IOICORP (-4 sen to RM4.97) on plunging CPO prices lately. The sharp profit taking fall yesterday was not unexpected given that the KLCI had rebounded 3.8% from a low of 1595 (24 September) to as high as 1653.8 (3 October). However, the selling was well absorbed. As long as KLCI maintains its posture above mid Bollinger band, we remain cautiously optimistic that KLCI will continue its gradual uptrend and test all time high of 1656 again as technicals are on the mend. A breakout above 1656 will drive index higher towards 1670 (weekly upper Bollinger band). 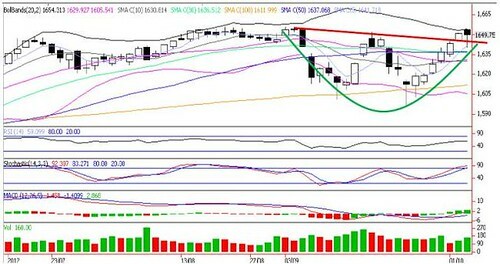 Supports are 1641 (5-d SMA), 1636 (30-d SMA), 1630 (mid Bollinger band). Daily KLCI: Market Undertone Remains Firm To Retest 1655-1660 Zones. 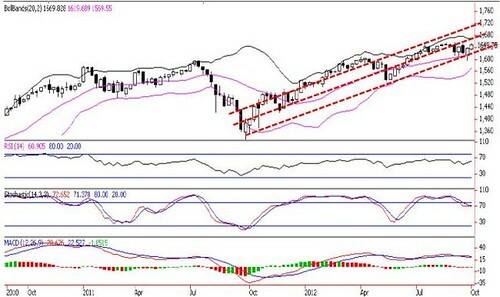 Weekly KLCI: Immediate Resistance At Upper Bollinger Band Near 1670.